Boland praised Kay Ryan's work as being "indispensable in the poetic cannon", saying that her work is "profoundly reassuring and moving" with its "independence of spirit and accuracy of expression". "The Things of the World"
"I Marveled At How Generally I was Aided"
"Poetry as a kind of money"
Rhyme: "Rhyme moves us forward and takes us out of our pedestrian thinking patterns. Yet rhyme is very aggressive." It is mad to work against it [accessibility]. Is one seeking more confusion in this world? 'Accessible' is taken erroneously to mean dimensionless. I strive to make my work as clear as I can. My effort is to make something accessible to me. Kay Ryan was asked about the short length of her poems. She said: "Short poems are my natural length." Kay Ryan was asked about humor in her poems. She said: "At first I wanted to be a stand-up comic. Then I wanted to write funny Hallmark cards. ... The comic is more difficult and exciting and more capable of carrying weight than the grave." Kay Ryan was asked what she did as Poet Laureate. She said: "I didn't want to represent American poetry. And so I haven't." She was, however, encouraged to speak about and applauded for her Community College poetry project as Laureate. Kay Ryan was asked about whether she had a daily writing practice. She said that she did initially because that is the way that a poet makes her work real to herself. She has to take herself seriously because at the beginning no one else does. Nowadays, she said, she writes irregularly and that to write a poem she takes 3 to 4 hours during which she writes 10 to 12 drafts. 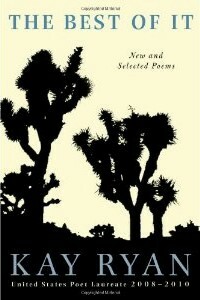 Copyright © 2010 by J. Zimmerman, except for the quoted poems.